1. Make sure the children enjoy and learn the skills of the games of Hurling, Football & Camogie. 2. Our priority must be placed on the needs of the child to enable them to maximise their own unique potential no matter what the match result. 3. To enable the child to understand that winning and losing are an important part of sport, but we ultimately play for enjoyment. 4. Prepare them to play, by learning the skills of the games of Hurling, Football & Camogie. 5. Build a sense of belonging to the Barryroe club. 6. Prepare them for future roles in the Barryroe club as: players, coaches, administrators or supporters. The Irish Sports Council Code of Ethics for Children's Sport is to be followed by all coaches and mentors of the Barryroe club. The clubs full code of ethics can be found in this document. The GAA have in place a scheme whereby coaches can become certified. Cork County Board run these courses, usually during the winter months and early spring. All coaches, mentors and selectors should complete at least the foundation level course which is a 7-hour course spread over two nights. The following diagram indicates the various pathways the one can follow to become a certified coach. The G.A.A has replaced the existing coach education structure with the above framework. The new structure consists of three separate courses which are divided into child/juvenile, Youth and Adult. 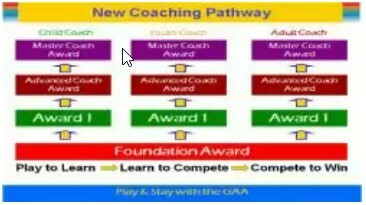 Within each of these three pathways there are three Levels/Awards, Award 1, Advanced and Master coach. Before commencing Award 1 all aspiring coaches must take the Foundation Award. If a coach has previously completed an old foundation course under the old scheme, that is sufficient for them to move on to the Award stages in the new coaching pathway. Being a coach can mean of lot of different things to people. Perhaps you work with kids, maybe its adults. The important thing is that you assist or challenge players to achieve their potential. Your aim should should be to nurture the skill and the will of the player over time. You should seek to implement a games based approach to training & development of players. Remember playing is about enjoyment. Players WANT TO PLAY. Everything we do as coaches should have that as our goal. Coaches should implement a games based approach to training & development and use as a basis to give practical expression to the following motivational ethos: “fun do, can do, we do”. This is the G.A.A. OTu model of coaching. It is also the LTPD worldwide way of developing and progressing players. By doing this a coach cultivates the playing and performance competencies which underpin the skill and win and the associated by-products of this: confidence, commitment, competitiveness and cohesion. You should encourage all players young and old at all stages of their development. If you find that you criticise players, is this beneficial to the player? Unlikely. Some times you need to tell a player something that he may not like to hear but it should come as part of a positive-negative-positive comment 'sandwich' and if possible should be on a one-to-one basis with the player. The coach must be familiar with Sports Science innovations, the concept of Long Term Player Development and advancement in coaching techniques all of which should feed into our coaching sessions. It is no longer sufficient for a coach to prepare a team based on what the coach may have done as a player themselves. Back then we did a few laps, did some static stretches, some drills and played a game. If you are doing these, is your training old-fashioned? perhaps. Now its all about Dynamic warm up's, SAQ Drills, Conditioned games, Game Drills, Core Work,Cool Down, Active Isolated Stretching. The games of hurling, football and camogie are fast, multi-sprint, multi-directional, high intensity, contact and with a ball games. They rely on a variety of different performance-related, or fitness-related, components or attributes. Examples of such attributes include speed, power, agility, reaction time, coordination, strength, aerobic & anaerobic endurance and the most important of all Skill. So now you know you need to know more that you thought you did!! Long Term Player Development (LTPD) or Long Term Athlete Development (LDAD) is an important concept for all coaches to consider. The term was first coined by Dr. Istavan Bayli who described the typical lifetime development of an athlete or player and how coaching and training should be applied to that player or athlete so that they may be the best that they can be. Over the years all sports organisations worldwide have adopted this approach to their coaching plans. The GAA has been no different in this regard with its OTu Developmental model. Bayli identified clear chronological stages in a players development. The following poster which can be seen on the Canada Sport For Life website identifies that different stages for both males and females as they develop and mature. It is important for all coaches to be familiar with it so they know what they do in coaching session will have a beneficial impact of the development of the child through to adulthood. The GAA as an organisation adheres to the principles of LTPD in all its coaching theory and uses it to underpin its OTu games development model which consists of three strands; the Pathway to Elite Performance (PEP), the Skill Through Effort Project (STEP) and Coach, Administrator and Education Programme (CARE for ALL). In this section we address the LTPD. The LTPD is best considered in terms of Capacities of growth and development of the player through their lifetime of participation within the G.A.A.